rewarding them with books for doing so! I am a 2010 Oklahoma State University graduate (GO POKES!) with my degree in Early Childhood Education and am a 3rd grade teacher at Discovery School of Tulsa. Two of my passions in life are: being an educator and being a runner. Since becoming a runner later in life I know the difference that it has truly made for me. I want to encourage children to get active each day so that they may experience the same positive benefits that I have experienced from physical activity. Over the summer I work with Project Transformation which is a children's literacy program that believes in transforming lives and revitalizing economically distressed communities by providing educational opportunities. “What a great place to start!” I thought. Encouraging these students to get active now at a young age could allow them to reap the benefits for a lifetime! After doing some thinking and planning we decided that we would encourage the kids to participate in at least 30 minutes of physical activity a day. The National Association for Sports and Physical Education recommends that school-age kids get 1 hour or more of moderate and vigorous physical activity on most or all days. Students not only will log their physical activities, but then once a week they will write about their experiences. Throughout the summer the students will keep track of their physical activity so that they can earn a book on their reading level for every 5 hours they log of activity. In this program not only will we get students active, but also get them reading and writing! Why tie in reading and writing you may be asking. Data shows that 37% of 4th graders cannot read on a basis level. That is not even referring to grade level, but refers to below grade level. Studies also show that only 53% of children ages 3-5 are read to at home. That means more than every 1 in 2 children are not held, cuddled and read to before they fall asleep at night. With these staggering numbers Endurance for Education wants to provide books to these students so that they have the resources to become competent readers. Out-of-school reading habits of students has shown that even 15 minutes a day of independent reading can expose students to more than a million words of text in a year! Those are the positive effects we want to see happening to students. Another shocking statistic says 25% of kids report no vigorous physical activity. *** That means when a 3rd grade class of twenty goes outside to play soccer 5 students will watch on the side lines. They will not run. They will not get their heart rate up. They will not improve their health and most likely they will have low self esteem. Can you imagine being that student who walks the boundary of the soccer field with their head down? What if all it took was encouragement and incentives for those 5 students to start adding physical activities into their lives? That is our hope here with Endurance for Education! We are supporting kids to begin a healthy, active life style by enduring through a minimum of 30 minutes of activity each day. Through their daily activity the students will gain the benefits of an active life while improving their reading and writing skills! 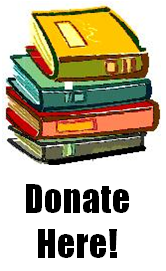 For every 35 cents donated that will allow one new book to be given to a child. Please donate to help encourage our youth to live a healthy, active life style and improve their reading and writing skills.